An insurance company will be responsible for paying compensation to the victim. If the accident is the fault of somebody else you are entitled to take a claim for loss and injury suffered which may include healthcare for serious injuries as well as repair of damaged vehicles. Vincent and Tim Shannon will ensure you recover the total compensation you deserve. Injuries such as whiplash, back and spinal injuries can cause long term loss and it is vital for you to instruct experienced lawyers, like Vincent and Tim Shannon. 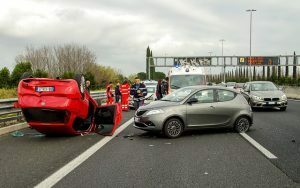 Even low impact accidents can cause serious injury affecting vital parts of the body such as the back, neck and limbs. If you were involved in a hit and run or an uninsured driver accident Shannons will deal with the Motor Insurers Bureau of Ireland who compensate victims of road traffic accidents caused by uninsured and unidentified drivers. With the help of Vincent and Tim Shannon you will be able to move on after a difficult time in your life, with a free consultation from our personal injury team to take you through your case.